The IEEE IP-XACT 1685 standard enables the use of a unified structure for the meta specification of a design, components, interfaces, documentation, interconnection of components, and Memories & Registers. This structure can be used as the basis of both manual and automatic methodologies. IP-XACT specifies the tight generator interface (TGI) for access to the data in a vendor-independent manner. Bunch of commonly used utilities around IP-XACT. Most of these utilities were created based upon different user requests over the period of time. EDAUtils provides complete IP-XACT solution needed in the design organizations dealing with IP creation or IP integration. It offers an intuitive GUI to build IP-XACT Component defintion by reading the ports and parameters from the RTL, instantiating bus interfaces, intuitively mapping ports and parameters, defining MEMORIES, REGITERS and BITFIELDS and their properties resulting in correct by construction. All the actions in the GUI gets saved into equivalent Tcl commands which can be reused later to update the IP-XACT in batch mode. There is a comprehensive Tcl shell which can be used to create & modify any IP-XACT file upto any extent that anyone may need. Apart from this, there are importers and exporters like verilog2ipxact, vhdl2ipxact, ipxact2verilog and ipxact2vhdl; utility to generate documentation from component. 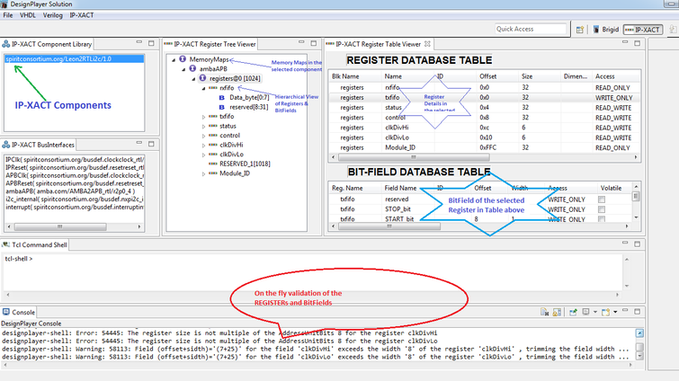 Tool to validate IP-XACT and tool to check consistency between IP-XACT Component and it's Verilog Model. Let's know if you need something which can not be achieved through EDAUtils offerings as listed below table.